An autistic boy and his mother take center stage in Cammie McGovern's suspenseful new novel. Cammie McGovern '85 recently published her second novel, Eye Contact, an absorbing murder mystery in which Adam, an autistic boy, is the only witness to a child's murder. Adam's mother, Kara, works to unlock the mystery of her son's autism as she tries to learn the identity of the killer. The book has been well reviewed, and film rights have been purchased by actress Julia Roberts. McGovern, the mother of an autistic boy herself, is donating a portion of the movie-rights sales and book sales to Whole Children, an after-school therapeutic play center she started along with other parents like her. Whole Children has been successful in improving the lives and development of children along the autistic spectrum. Recently, the Bulletin had a chance to speak with McGovern about Eye Contact, autism, and the writing life. Bulletin: Would you consider this book to be mainly about autism, or do you see the mystery as more central to the story? McGovern: It's probably more the story of how the mother's determination to understand the crime parallels her determination to understand her son better. But what I'm hoping people take away from the book is that these kids on the autistic spectrum, of whom there are so many now, are capable of amazing things sometimes. Bulletin: What was the greatest challenge in writing this book? McGovern: It's a struggle to get a voice that works. For this book, it was hardest to get Kara, the mother. I was trying not to write her as myself. That's why I raised the stakes in so many areas of her life: she's single and her parents are dead. I wanted her to be isolated, as a reflection of how I felt in the early years after my son was diagnosed. Even though I had a very supportive husband who was a good father to our difficult son, when a child is autistic it feels as if you are all alone with this child, struggling desperately to help him gain language. You're logging in hours together with flash cards and you're very alone. Bulletin: Had anything else in life prepared you for that? Bulletin: How did you cope? 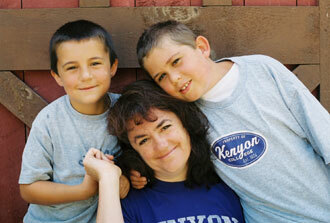 McGovern: My solution was to have other kids, just so I could stop thinking about autism all the time. I wanted to know what regular parenting is like and experience that, too. Ten-year-old Ethan has two little brothers, Charlie, age seven, and three-year-old Henry, neither of them autistic. Charlie is already very protective of Ethan at school, but then he's driven crazy by him at home much of the time. One study has shown that autistic kids who are doing the best generally have siblings, and pets. Having a rich and stable family life, eating together, helps all kids. It helps autistic kids the most, too. Bulletin: You recently published an op-ed piece in the New York Times arguing that parents shouldn't give in to pressure to bring their autistic children to recovery before they reach school age. McGovern: I was trying to say, Let's celebrate what these children can accomplish instead of trying to get them to pass. When your child is first diagnosed, every parent says, "My child is going be the recovered one." The pressure is huge, so parents try to get their child to not seem autistic. It becomes a battle against the innate tendencies that are hard-wired into your child. I have myself tried to get my son to stop bouncing or flapping, doing things that look odd but that simply feel good to him, to get him to pass as more normal. At some point I thought that this is not just battling the autism, this becomes a war with the child. It's not fair to the child. Autism is part of his picture and let's not be looking to have that get erased completely, because it's not going to be. Let's look at everything that is successful about him and everything he can do, and let some of these other features be and just press on and let go of it. The parents I know who have kids on the spectrum are an amazing group that have learned this lesson the hard way. Bulletin: What was the response to the Times piece? McGovern: I got a flood of letters. The first three or four were from people wanting to show me video of their recovered child, and I got my stomach in a knot. Then I got 120 sympathetic letters from people saying this is the great lesson of acceptance that my child has taught me. By far, the vast experience with autism is that it changes the parents far more than the child. It's a process of both grieving in the beginning and then coming around and celebrating and loving this odd-duck child who is who he is. These letters were so loving and so sweet. Some of them made me want to weep. Bulletin: Friendship is a central theme in Eye Contact, and yet hardly any of the characters, child or adult, finds it easy to make a friend or to be a friend. talk honestly about whatever that struggle has been. Bulletin: Your first novel, The Art of Seeing, was about photography and image. Your second one is titled Eye Contact. Why does the visual realm keep recurring in your themes and titles? McGovern: In high school, my great passion was photography. I didn't start writing until the second semester of my senior year at Kenyon. The visual was a huge part of my first book, where the one sister is a movie star. In this one, I was looking for a title that parents with kids on the spectrum would recognize, a catch phrase, and know that it might have something to do with autism and that the kid was a witness. Bulletin: What did you learn from your first novel that helped shape Eye Contact? McGovern: That first novel was a nice experience but it didn't sell very many books. I wanted to do a mystery because I enjoyed reading them, but I also wanted to have something that felt like a success, because fourteen years of failure just felt miserable. The writer's life is a very difficult one, and at some point you think I can't bear this anymore. I wanted to write something that people would want to read. In between the two published books I had one that was very ambitious and it just didn't work. I kept trying to rewrite it and it got worse and worse. So when I came to Eye Contact, I came to it angry and with this full head of steam. It's not that I had to write something that would sell or be commercial, but it had to be complete and functional, a finished book that could be put between two covers, so I could stop feeling like a failure. This book gave me the chance to write some real things about Ethan, and to try to say something true.